It's approximately 168 miles from Round Rock, Texas, to Houston. Yordan Alvarez is making that distance look smaller with each passing day. The No. 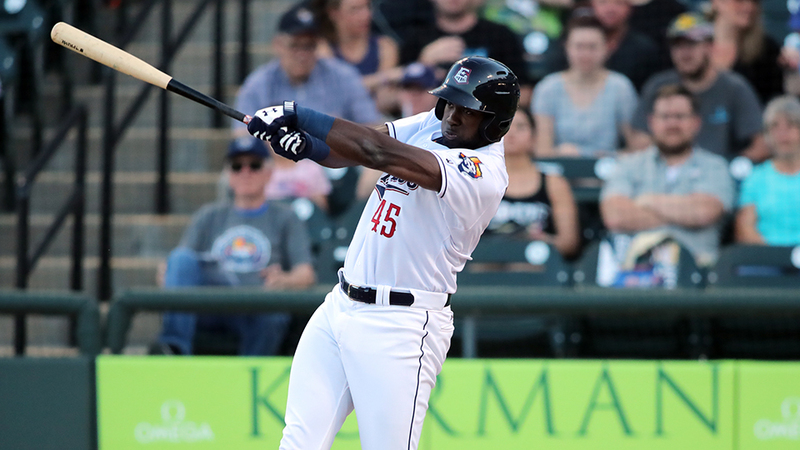 3 Astros prospect homered for fifth time in six games, doubled twice and drove in a season-high four runs to help Triple-A Round Rock defeat Nashville, 9-5, in 10 innings on Wednesday at Dell Diamond. Since beginning the year 0-for-3 with two strikeouts, he's 9-for-23 (.391) with five roundtrippers, 10 RBIs and six runs scored. Alvarez recorded the Minors' first three-homer game of the year on Saturday at New Orleans. His effort Wednesday night might have lacked the fireworks of his weekend achievement, but it was no less important for the Express. Alvarez struck out looking to begin the second inning before lining the first of his two doubles to left field in the fourth. His RBI double snapped a 1-1 tie in the sixth and he untied the game again in the eighth with a three-run blast over the left-center field fence. He was intentionally walked leading off the 10th and scored on Nick Tanielu's walk-off grand slam, the first of his career. "The power is there, everybody sees it, but I think what's really cool and fun to watch is when he locks it in," Round Rock hitting coach Ben Rosenthal told MiLB.com on Saturday. "His plate discipline and ability to hone in on a certain pitch and ability to lay off other pitches, that's what's really impressive -- when he tightens it in on the zone and he's only going after whatever he's committed to and he won't flinch at anything." Signed by the Dodgers in June 2016 and traded to the Astros a month later, Alvarez has blossomed into one of the game's best prospects. MLB.com's No. 43 overall prospect batted .304/.379/.481 with 12 homers and 69 RBIs in 90 games with Class A Quad Cities and Class A Advanced Buies Creek in 2017. He carried that success into last year when he established career highs with 20 homers and 74 RBIs while hitting .293/.369/.534 in 88 contests between Double-A Corpus Christi and Triple-A Fresno. The 21-year-old was invited to Spring Training, where he more than held his own. The Cuba native hit .265 with three doubles, seven RBIs and six walks in 49 Grapefruit League at-bats. "Just watching him grow, he's always been willing to listen and learn and do things. Its always been in there," Rosenthal said. "Like any player, he's refining his skills and learning himself a little bit better, what he can and can't do at the right time. ... It's like he's putting all of the pieces of the puzzle together and connecting all these dots. It's cool to see him do that and take off." Astros No. 16 prospect Myles Straw doubled, singled, walked and scored a run for the Express. Jack Mayfield singled twice and scored three times. Round Rock's Brady Rodgers turned in his second consecutive strong start. The 28-year-old gave up a run on five hits and a walk with six strikeouts in six innings. Astros No. 20 prospect Dean Deetz walked three and allowed Zack Granite's game-tying triple in the ninth, but Brendan McCurry (2-0) worked out of a bases loaded, no-out jam in the 10th to get the win. Nashville's Willie Calhoun stroked a game-tying RBI double in the eighth, singled and walked. Sounds starter Ariel Jurado yielded two runs, five hits and a walk while fanning three over six frames. Miguel Del Pozo (0-1) was charged with five runs -- four earned -- on three hits and four walks over 1 2/3 innings, striking out two.